Collision repairers call themselves “I-CAR certified,” “Ford certified,” “ASE certified” — but are they using the terms correctly, and if so, do customers even understand or care about what’s been measured? I-CAR, for example, teaches a great deal but doesn’t certify anything except welding. Automotive Service Excellence certification involves a written test and two years of experience on a resume, but doesn’t apply a hands-on test. Several automakers use the benchmarks set by “auditor” Assured Performance, and others require even more from repairers. And none of these warranty the work being done on the vehicle, just as a driver’s license doesn’t mean you’ll drive safely and CPA status doesn’t mean an accountant won’t screw up your taxes. This is not to say that any of these — including noncertified I-CAR education — benchmarks aren’t worthwhile. All do denote a shop or technician who has demonstrably invested more time and effort into improving themselves than a party who hasn’t. But it’s important for consumers — and shops — to realize precisely what capabilities that frame or logo on the wall indicates and what it doesn’t. 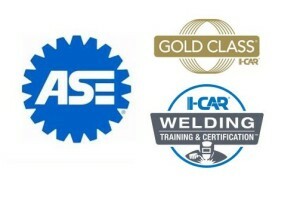 Today, in part 1 of a two-part series, we look at what I-CAR and ASE certify. Check back this week for part 2, which will include details about OEM recognition through Assured Performance and a repairer’s perspective on OEM luxury certification. “We don’t certify shops. We certify people,” stressed John Tisdale, executive director of ASE test development operations. Collision repairers can obtain certification in one, some or all of five fields: Refinishing, nonstructural analysis/repair, structural analysis/repair, mechanical/electrical and damage analysis/estimating. Though ASE certifies mechanics as well, the mechanical/electrical certification for repairers deals specifically with items commonly encountered by body shops. To get any of those certifications, the repairer must complete a test created by some of the “best minds in the collision repair industry,” with “on the average of about three (hundred) to five hundred years” of experience combined, according to Tisdale. Only about 50 percent of applicants pass the first time. It generally tests competence, not safety — “It’s a set of skills, Tisdale said — and the questions are re-evaluated by the “jury of their peers” every couple of years to keep the scope current with automotive trends. The technician must also have two years experience in the industry, though it doesn’t necessarily have to be two years devoted to the specific item being tested. To avoid resume padding or outright lying, ASE requires one’s employer to sign off that the work experience is correct. ASE even uses psychometricians from a testing management company — at one point, it was the guys behind high schoolers’ ACT — to ensure the questions are clear and have only one right answer. Certification is good for five years, then one must recertify. “They’re demonstrating that they’re staying up on the new technology,” Tisdale said. ASE checks this every year, and it has the records to show the technicians are all current on their certifications. Again, pretty straightfordward. Where things might get muddled is with the ASE blue and white sign. A collision repair business can display it by having a single employee certified in a single ASE element. Unlike the Blue Seal of Excellence, ASE doesn’t check in the future to make sure a single ASE-certified employee still even works there. He and marketing manager Jennifer Holland said ASE needed to examine and educate consumers, but it was really up to the body shops themselves to explain what certification meant. I-CAR CEO John Van Alstyne was clear about what his organization certifies, including that no shop is actually certified, merely identified for the skill and continuing education displayed by its employees. “In reality, our Gold Class designation is really … a recognition program, not a certification program,” he said. He likened it to a college degree compared to a CPA exam. One says you went to class, another shows you passed a test. I-CAR estimates only 10 percent complete the kind of employee training needed to make the Gold Class cut. Staffers called “Role Reps” — at minimum, I-CAR requires an estimator and single refinishing, structural and nonstructural technicians be so designated — must do the coursework to become certified Platinum (which in some cases involves the welding certification) and then continue their education after that. Everyone else at the shop also must undergo some sort of training every year. But I-CAR’s welding program does truly certify competence in sectioning, aluminum welding and steel welding. “We’re also in the process of working on a few additional welding programs as well,” Van Alstyne said. Students must take a test and perform welds correctly, and they must recertify every five years. The welder’s shop itself is also audited to ensure it has the equipment necessary. Correction: An earlier version of this article indicated Part 2 would run Tuesday; it has been corrected to reflect the article’s new expected run date.